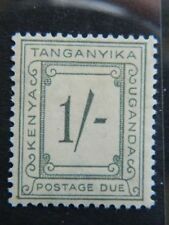 Kenya Uganda Tanganyika 1954 Queen E.II 8v up to 5 Shillings Used Stamp. 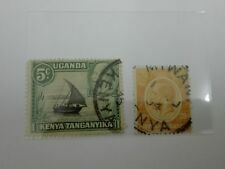 Kenya Uganda Tanganyika 1954 Queen E.II 3v 1, 2 & 5 Shillings Used Stamp. SG131a 1c Brown 1942. SG138 15c Green 1952. SG132 5c Green 1938. SG136 10c Grey 1952. SG133 5c Orange 1949. SG134 10c Orange 1938. 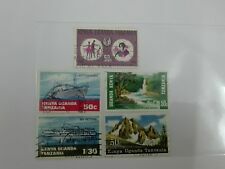 Nice range of low values KGVI all MNH - see photos. THIS COVER IS IN GOOD CONDITION. SG149b 10/- Blue 1944. 10 Shilling KGVI - MNH - see photos. Kenya, Uganda and Tanganyika. SG147 3/- Ultra Black. 3 Shilling KGVI - MNH - see photos. Kenya, Uganda and Tanganyika. Fine mounted mint CAT £960. Uganda QV 1898-1902 2a. Red Brown SG86 VLM/Mint. MNH= The stamp has never been mounted. KENYA (K.U.T.) KGVI 1938 Issue 3s.40d. Booklet SGSB3 Complete and unexploded. SG 93-107 Tanganyika 1927-31. Fresh mint set of 16 CAT £500. KENYA U & T. Very clean Mint & Used collection on album pages with many Complete sets. Doing that is against U.S. and international laws. 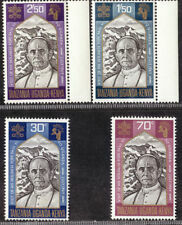 KENYA, UGANDA & TANGANYIKA POSTMARK - NAIROBI REGISTERED POSTMASTERS ENV + Lrd. FROM THE (HEAD?). 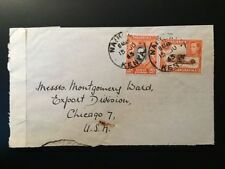 THIS IS ON A REUSED ENVELOPE WITH A O.H.M.S. LABEL (T.P.O. VERY UNCOMMON! ). ARUSHA (Misspelt) Skeleton - NOV 1953 (Unlisted). ON COVER TO LONDON TO FORWARD ON. KUT George VI SG150 £1 black & red - perf 113/4 x 13 - superb marginal copy - very lightly mounted. Catalogue £500. SG 73 MINT Never Hinged Cat value £150 ($190) Violet and green Watermark Mult Script CA. Deep color . 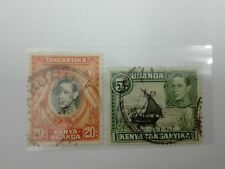 Kenya, Uganda and Tanganyika 1938-54 George VI Complete set SG 131-150b Mnh. Kenya, Uganda and Tanganyika. SG 131-150b. 1938-54 George VI Complete set 20v. 1922-24 Giraffe set 5c-£1. F-VF fresh M/MLH. SG 74-88 cat £625. Popular set. (15). We strive to display the highest quality images. Authenticity Policy. Kenya, Uganda and Tanganyika - 1938 10s Purple and blue 'HARE LIP' Variety - MM / MH. Kenya, Uganda and Tanganyika - 1938 10s Purple and blue - Perforation : 13¼. Single value showing printing flaw resembling a HARE LIP on lower lip - Mounted Mint / Mint Hinged. 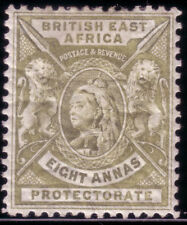 SG 67/VAR British East Africa 1896-1901. KENYA UGANDA TANGANYIKA. Complete set of 1954-1959 definitives. Mint, never hinged. Ex The Caerynn collection. INTEREST-FREE CREDIT OPTIONS UK Personal Cheque. 1904 KEVII 2a. General Information. SG 16s MINT Lightly Hinged Cat value £450 Grey and red-brown Exceptionally fresh, overprinted “SPECIMEN”. When you buy more than one item from us at the same time we combine postage and packing charges. All packages are water-proof fully insured. Brilliant, Just as described, Great communication, Would buy again. 21 FEBRUARY.